Some people will argue it looks good, and maybe it does. But if you employ a long exposure technique, it could be so much better. The big difference between taking a photo with a smart phone, or a cheap 'point and click', compared to using a good Camera and Lens combination is that, with the latter, you have finer control of your camera to enhance what you are trying to capture. Take for instance the two photos above of Wes Beckett Falls. The two photos were taken within seconds of each other, with the first photo being an 'instant' photo, and the second photo using a long exposure technique of 0.5 seconds, meaning that I set the camera to take a 1/2 second exposure of the waterfall. Why did I do this? In my opinion, getting a good balance of long exposure actually gives a photo of a waterfall a sense of flow. A good photo should instantly give you a feeling of what it would be like to actually be visiting that waterfall. Instant cameras do exactly what they are meant to do. They take a snapshot of a moment in time, and with waterfall photography, an instant camera will give you a photo of hundreds of droplets sitting mid-air in a photo, like we see on the photo in Figure 1. Is it a realistic impression of a waterfall? Not in my opinion. Thankfully, with long exposure, you get a real sense of the 'flow' of the waterfall, as well as getting a 'feel' of the tranquility a waterfall can resonate within you, and that is important for waterfall photography. A mistake I see many budding photographers make is setting their exposure too high, a mistake I've frequently made, especially in my earlier days running around with the camera. Setting the exposure too high on a waterfall will result in a waterfall no longer looking natural. The water will look feathery and misty, or in worst case scenarios, look just plain wrong. Figure 3: Too much exposure results in unrealistic photos. I've had people ask me, 'What are the perfect camera settings for waterfall photography?' There is no right and wrong answer to this. Each waterfall will have different amounts of water flowing through it, and the flow of water can vary dramatically throughout the year. Also, lighting will always play a factor as to what your exposure should be. The best advice I can offer is practice with different settings on your camera, and over time, your experience will help you figure out ideal settings for each waterfall you encounter. So, you're wondering what a CPL filter is? Well, it's a filter that is placed over your lens to help take better photos. As vague as that answer is, it is actually true. For a full detailed description of what a Polarizing Filter is, check out the article on Wikipedia. But in a nutshell, polarizing filters help suppress glare and reflections, and often improve colors. Figure 4: Photo with no filter. Using two photos of Elvers Falls, Figure 4, taken with my iPhone, shows a lot of the sun reflecting from the water. In the image, you can see over-exposed parts on the water, due to the brightness of the sun bouncing off the water. When you compare the photo with the one taken with my Canon 70D DSLR Camera, it becomes immediately apparent that a lot of glare has disappeared, even though you can see exactly where the sun was directly shining onto the water. Figure 5: Glare diminished due to CPL Filter. Both photos were taken within 30 minutes of each other on the same day (middle of the day, I might add), and although the vantage point of the photos are different, the lack of reflective hot spots in the image shown in Figure 5 is due to the CPL working in my favour. CPL filters will help you balance the amount of light that enters into the camera, and this in turn helps to provide better, more consistent photos. To demonstrate this point, the iPhone photo of Elvers Falls shows the waterfall being dark, but the water in front of it being over exposed. With a CPL filter attached to my DSLR, it helped prevent much of the glare resulting in a more consistent exposure throughout the entire photo. Easier said than done, but photographing a waterfall in sunlight is a nightmare for any budding photographer. In fact, the best lighting to use for photographing a waterfall are those dark cloudy days! And even then, early morning, or late afternoon / early evening are often the best times to photograph a waterfall. Natural light plays an enormous part in the composition of a photo, and direct sunlight bouncing off a waterfall, and its surrounds will always hinder waterfall photography. Why? A photo can really only be as bright as the brightest part of the photo. Take, for example, the photo of Snug Falls. The photo was taken around midday, with direct sunlight bouncing off the top of the waterfall and rock areas, the rest of the photo is shadowed. What is striking about this photo is that the sunlit area is well and truly over exposed, where as the shaded area is very much under exposed. This is what sunlight can do to a photo, and taking a very good photo in bright sunlight is often very difficult. Sunlight will always result in your waterfall photos having high contrasting areas between bright and dark. So, what do you do if you have no choice, the sun is shining, and you're at a gorgeous waterfall? Many cameras have an automatic mode that will try and work out what is best for you, and I would suggest using that. If you're like me, and predominantly photograph using the manual mode of your camera, I will always set the ISO to 100, I will set my aperture (also known as F-stop) to F22. The higher the F-stop number, the less light that enters into your camera. And then, I would work on my exposure times, to try and get a good balance for the photo. In my experience, every photo I've taken of a waterfall in sunlight has resulted in having to spend considerable time using tools like Adobe's Lightroom, or Photoshop to brighten up the dark areas, and to try and decrease the brightness of the over exposed areas. In some cases, I've even blended two images together, one photo that was setup to handle the sunlit areas of the photo, and a second photo that was set up to handle the shadowed areas. Post-processing photos is a skill that all photographers, whether amateur or professional must learn, and a skill that will take considerable time to master. You cannot take a good waterfall photo without a tripod - period. I've actually had arguments with people telling me how wrong I am, but I will stand by my tripod rule. To take a long exposure, your camera must be perfectly still, so you don't end up with blurry photos. Without a tripod, you will be forced to take a photo with a very low exposure rate, that in turn results in those 'droplets of water sitting in mid air' photos. Stay back! Don't get too close! Whenever possible, take a photo from a distance, showing the waterfall within it's environment. A waterfall on it's own doesn't really impress until it has context, and the only way you can get context in waterfall photography is showing it in it's natural environment. This is where photography equipment comes in handly. Wide Angle lenses are fabulous for capturing a lot of area even when we're physically close to a waterfall. 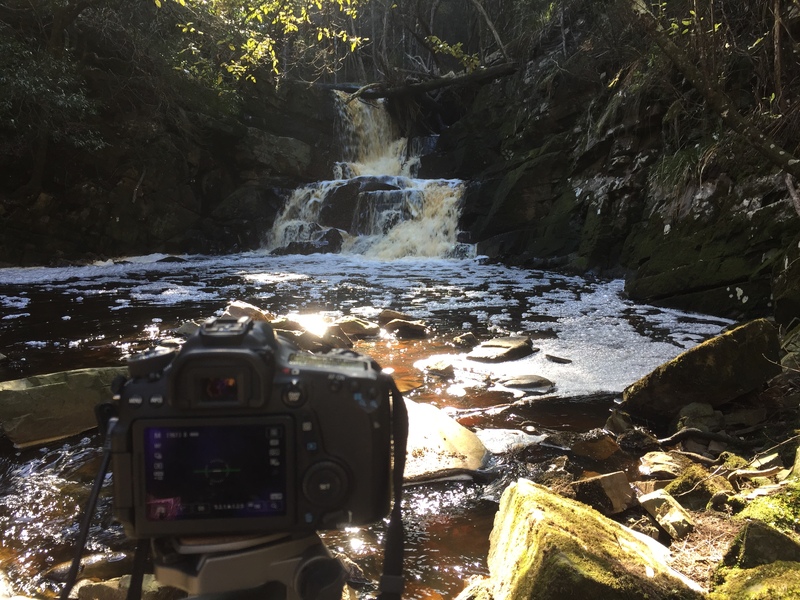 I personally use a 16mm Samyang lens on my Canon 70D for taking photos of waterfalls. I also have a 14mm Samyang lens, which is wonderful for night photography, but it is impossible to fit a Circular Polarizing Filter onto it. However, my 16mm has no issues, and that's my go to lens for photographing waterfalls. Bare in mind that the Canon 70D is a X1.6 crop camera, meaning that my setup with a 16mm lens attached would be somewhat equivalent to using a full frame camera with a 25.6mm lens. The point with this is, a full frame camera with a 16mm lens attached to it would capture more of the scene than a crop camera would with the same lens attached. Have fun when visiting waterfalls and photographing them. Always take multiple photos, from different angles, with different camera settings. You will be surprised at how some photos, whilst they looked magnificent on your camera's view finder, are rather average on a big screen, and yet, how an 'average' photo on your camera might be the stunner photo you've always wanted to capture! Always focus on different areas around the waterfall, and take multiple images. It is not always easy to focus on absolutely everything in an image. The trick is to learn from your mistakes, and try and work out what that 'sweet spot' is for taking a lovely waterfall photo. Also, always try to get your horizon straight! Some DSLR's have a level, and some tripods also have a level, where you can set your camera to have a perfect horizon. Nature photos always look better when everything is captured the way it appears in nature. It's rare you go to a waterfall and tilt your head to appreciate it. And finally, the most important tip of all, respect our environment, and develop a huge respect and appreciation for the waterways, rivers, and waterfalls we have in Tasmania.